BAM Nuttall – Wichelstowe, Swindon, Wiltshire. 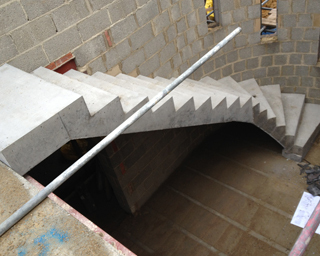 LeRoc designed, supplied and installed some of the largest precast concrete stair units we have ever produced as part of a major project to provide infrastructure for new development to the south of Swindon. The first phase of works consisted of two stair flights which were used to provide pedestrian access connecting from a new footbridge across the M4 motorway to a new footbridge across a section of canal. The heaviest of these units weighed 17.5 tonnes, and these were lifted into position using a 500 tonne crane. The second phase of works consisted of two stair flights which formed part of the towpath alongside a new constructed canal lock. 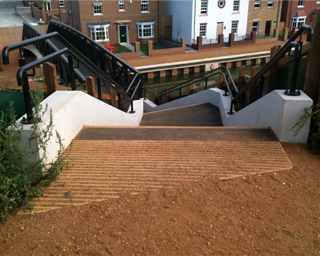 These stair units were supplied with an exposed aggregate finish to best match the gravel construction of the new towpath. Wilkins Builders - Lydiard Millicent, Swindon, Wiltshire. LeRoc designed, supplied and installed 160m2 of 150mm Beam & Thermal Block flooring system at Lydiard Millicent, Swindon using a 35T all terrain crane. This project was completed within a day. The client specifically asked for the Beam & Thermal Block System which we can supply and fix as to achieve a higher ‘U’ value than the standard Beam & Block Flooring System. 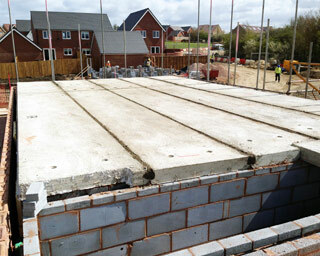 Cowlin Construction – Mallard House, Newbury Business Park, Newbury. 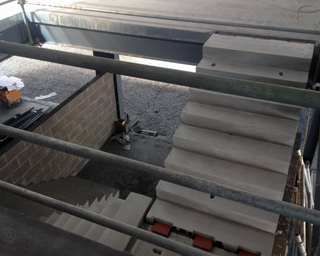 LeRoc designed, supplied and installed precast concrete stair units to two new stairwells as part of a refurbishment project to an office building. One of the stairwells was located inside an area of the building already covered by the existing roof. Installation was achieved through using a combination of a crane off load delivery vehicle to place the units through the open side of the building onto machine skates, the units were then manoeuvred through the building into the stairwell area. From there the units were hoisted into position using a 40 tonne city crane which was located outside the building with the boom extended through the open side and over the stairwell. 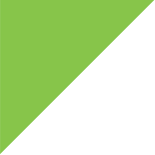 Leadbitter - Kingsclere Golf Course, Hampshire. 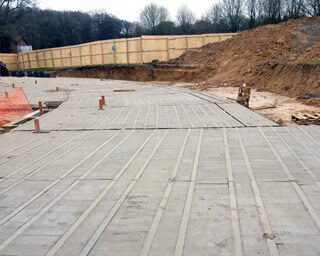 LeRoc designed, supplied and installed 1070m2 of 150mm and 225mm deep Beam & Block flooring. Over a 2 week installation using a 35T all terrain crane in multiple positions to keep costs minimal, the new block for the hotel was achieved in the shape of a curve facing the driving range and golf greens as per the architect's drawings. Gravan Construction – M & P Motorcycles, Gorseinon, Swansea. 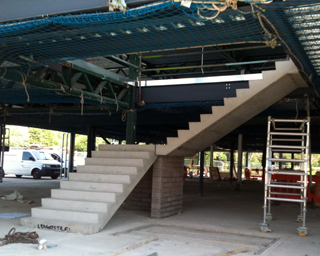 LeRoc designed, supplied and installed precast concrete stair units to two stairwells within a new motorcycle dealership and parts and accessories warehouse building. This project presented the challenge of installing stair units within a partially completed building. As the external structure and roof were already constructed, the units had to be placed using the combination of a telehandler to feed the staircase into the base of the stairwell, and a 35 tonne crane to then lift the units up and into their required positions. One stairwell, consisting of three stair flights with integral landings, required the crane to be located inside the warehouse area of the building, the other saw the crane positioned outside the building, with the boom extended into the building through a new window opening to position two larger stair flights with integral landings. To achieve this took extremely careful planning, and crane operator with a very delicate touch. 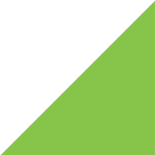 Beards - Paxcroft Primary School, Trowbridge, Wiltshire. 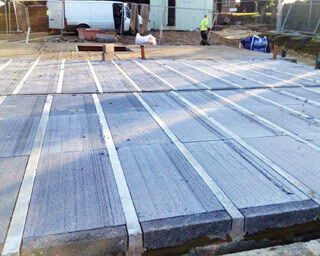 LeRoc designed, supplied and installed the Beam & Block Flooring for the extension of a classroom and the main hall for Paxcroft Primary School. Our installation team used a 35T all terrain crane over 2 visits. First was the 151m2 of 225 deep Beam & Block in one days fix and then 388m2 of 225 deep Beam & Block installed over 2 days bedded and grouted, on time to our clients satisfaction. Paul Cording – Evergreens, Sutton Courtenay, Oxfordshire. LeRoc designed, supplied and installed 150mm deep beam & block ground floor, 150mm deep hollowcore slab first and second floors and precast concrete stair units as part of the development of a new house. What made this project particularly interesting was the provision of a curved stair flight, which formed the main feature staircase in the entrance hall to the house. This required accurate engineering to form the mould, thus ensure that the unit would fit precisely and provide the architectural feature that the client desired. Redrow Homes - Sand Pit Lane, Calne, Wiltshire. LeRoc designed, supplied and installed 65m2 of 150mm deep Hollowcore for Redrow Homes at their Sandpit road development in Calne, 3 miles away from our Offices and yard. 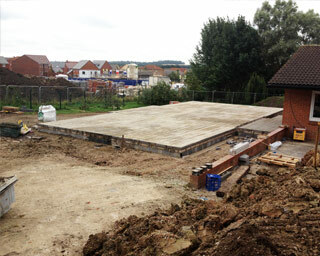 Using a 35T all terrain crane the coach house was installed and concreted within 3 hours to satisfaction of our client.